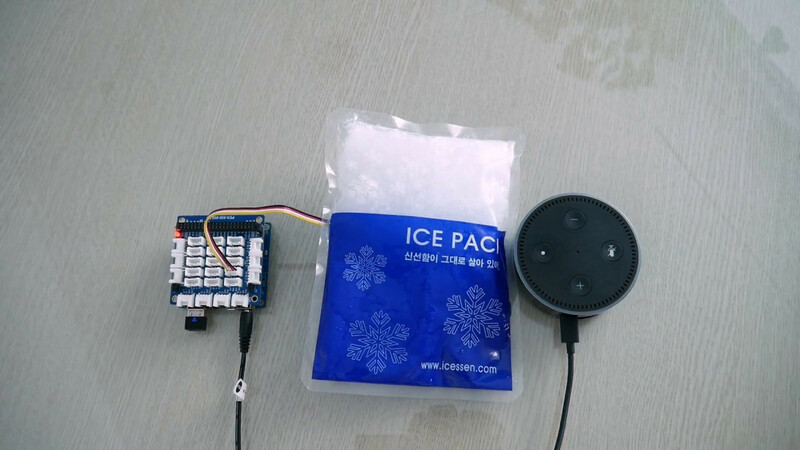 In this article, I am going to show how to use Amazon Echo to read temperature and humidity from sensor. Step 4: Writing source code on PHPoC to handle HTTP request from Lambda Function, read temperature and humidity, and send back to Lambda function via HTTP response. “Why uses PHPoC for this project?”. The answer is PHPoC is an IoT hardware platform which has a webserver and a variant of PHP interpreter. From PHP script, we can read value from any kind of sensor and send the value in HTTP response. As I described before, the system includes four parts. The following is five steps to do on four parts, respectively. Click “Add a New Skill” button, fill some information as below, click “save” and then “next” button. Make a HTTP request to PHPoC and get response which contain temperature and humidity. Send the response back to Alexa. Go to https://aws.amazon.com/ , Click “Sign in to The Console” button at the top-left. You will see a template function “alexa-skills-kit-color-expert”, click download icon to get the sample code. We will modify and compare this code later. Then, close download window and click “Blank Function”. (Amazon may change the template code overtime). Click “Create Function” it will redirect to function management page. You will upload code at this page. Please pay attention to the upper right corner of the ARN string, this is the endpoint of this Lambda function which we will put it in Alexa Skill configuration in step 2.
we downloaded ““alexa-skills-kit-color-expert”” sample code. Unzip this code and see the index.js file. I modified it to read temperature and humidity. You can compare my index.js code and index.js code from template to see the difference (I recommend to use the WinMerge tool for compare two file http://winmerge.org/ ). When you compare two file, it’s easier to understand the source code and how it works. Note that: you need to change IP address or domain name of your PHPoC board in this source code. In case you use the private IP address, you need to set port forwarding on your router or access point. Since this source code does not use any the external library, we can paste this code directly to online editor. Step 4: Source Code on PHPoC to Handle HTTP request from Lambda Function. In this code, we just need to write a PHP script to handle HTTP request. When receiving a HTTP request, this code read temperature and humidity from sensor and send them to AWS Lambda function via HTTP response. Last edited by Khanh; 03-01-2018, 09:27 AM.